Cooler and wetter weather has returned to Montpellier. City forests and natural areas which have been closed all summer because of fire danger have reopened. 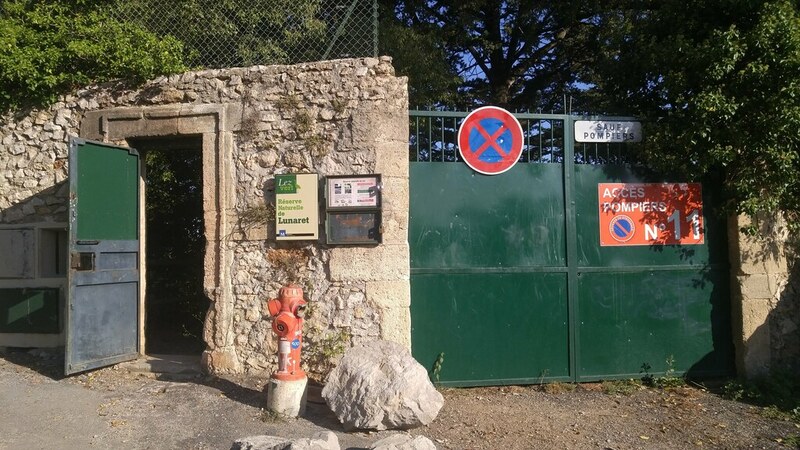 This steel door at the southwest corner of Montpellier's Zoo Lunaret has been shut all summer, but is now open from 9 to 19. I took the photos for this post with my G4 on a morning run around the Zoo at the end of September. Bois de Montmaur, the wooded park on the outcrop west of the Zoo is open for business. 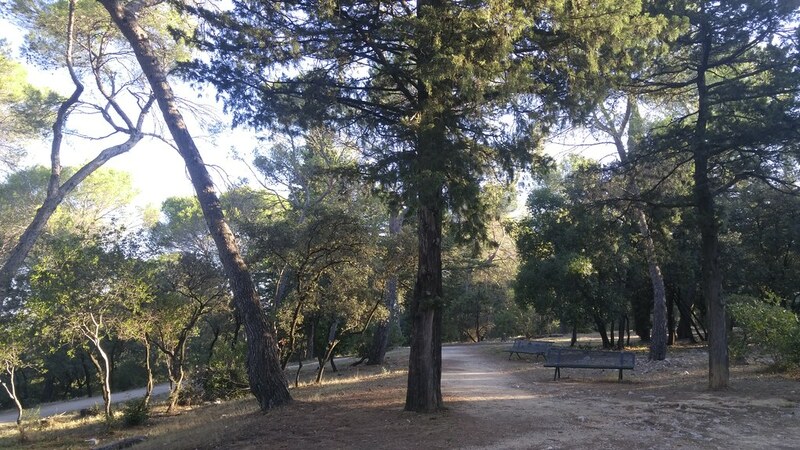 It's a great place to go for short hill repeats and is just big enough (27 hectares, or 66 acres) to provide the illusion of being in the oak woodland (called the garrigue here) outside the city. Directly north of the bois and zoo is the Agropolis International campus. 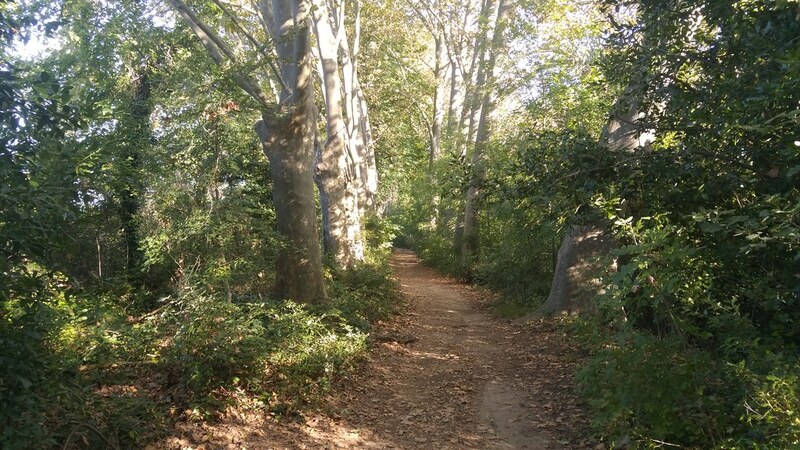 Behind its cluster of buildings, next to the Lez (Montpellier's primary river), is a stretch of pleasantly quiet and shady foot trail. Beyond a canoe and kayak park the trail enters the Réserve Naturelle de Lunaret and tiptoes along a section of short cliffs above the river. 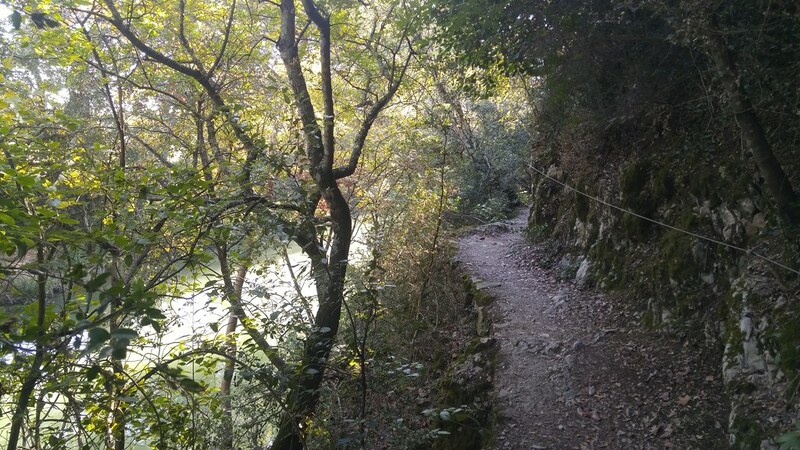 The cable hints at how slippery the mossy limestone can be during the rainy season, and while the Lez is low now, you wouldn't want to fall in after one of the episodes (cévenols) of torrential rain that can happen in fall. After a kilometer of rough conditions, the trail opens up again near the southwest corner of the zoo. These parasol pines (Pinus pinea, the tree that gives pine nuts) are just on the other side of the green steel door I showed at the top of this post. I've been enjoying running the streets and paths of Montpellier, but I'm very happy to have easy access to dirt trails and nature again. I'm not alone in this feeling; I shared every stretch of this loop with other runners, some of them obviously radiating with pleasure. On October 16 I'm going to do the Trail des Calades, a 16km trail run at the foot of the Pic St-Loup. It's the 3rd edition of this event and looks like it'll be a bit like the Black Squirrel, but shorter and steeper. There are one or two races like this within an hour's drive of Montpellier almost every weekend. 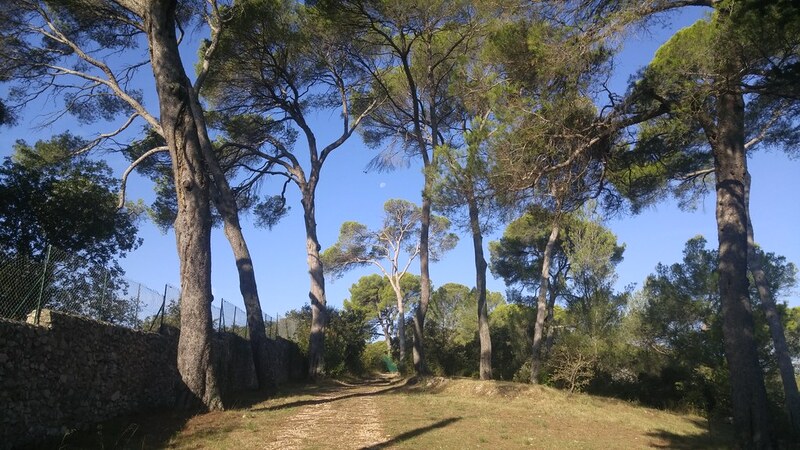 I'm using it as training for the 20km road race in Montpellier on November 27 and don't have any ambitions other than to finish without getting injured and enjoy some fresh air and good company.